So, I watched World War Z recently. I’m a fan of Max Brooks and the epistolary tale he created about life during (and after) the zombie apocalypse. This big-budget summer blockbuster starring Brad Pitt really only has the name in common with the book, however. While I’m not a huge fan of the zombie genre in general, I went in with an open mind. I wasn’t expecting Shakespeare or Joss Whedon, just a visually stimulating romp through zombie-infested cities. Even with what could be considered modest-to-low expectations, I did not care for the movie overall. There were far too many coincidences that bothered me, too many things that seemed to ring false. Don’t worry, this isn’t a movie review, but there’s some spoilage ahead both for World War Z and Star Trek: Into Darkness. If you are allergic to spoilers, and haven’t seen these movies, you should ‘opt out’ now. Consider yourself forewarned. 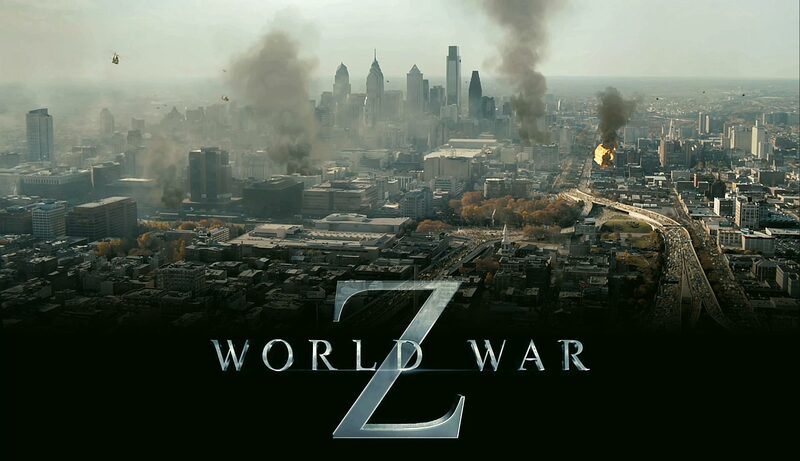 Not to be confused with the book, World War Z. Okay, continuing on…there is one sequence in WWZ that takes place in Jerusalem. It was the breaking point for me. The Israeli government has erected an incredibly tall, seemingly unassailable wall to keep out the zombie swarm. When I say ‘swarm,’ I mean it. The zombies on the other side of the wall look like an overturned anthill or something from A Song of Ice And Fire. The Israelis even have armed helicopters running air patrol around the edge of the wall. It wasn’t that a young Muslim girl singing over the PA was apparently loud enough to draw the zombies en masse (especially when there are a bunch of helicopters nearby). 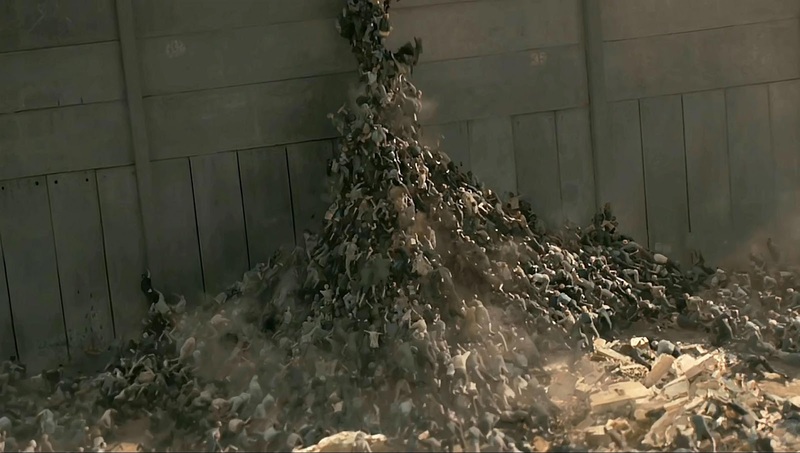 It wasn’t the zombies piling on top of one another (in what was certainly a concerted effort) to scale the gigantic wall in two minutes that was the breaking point either. No, it was the fact that there were zero guards up on the top of the wall keeping an eye out. When zombies start coming over the wall, everyone is surprised. You would think that if the Israelis were so intent on building this gigantic fortification, that it might look like something from a prison with watchtowers every hundred feet or so. Nope, the zombies get all the way to the top and start pouring over, catching everyone flat-footed. That scene felt incredibly contrived when I saw it. It felt like that the various screenwriters attached to the project had needed the zombies to get over that wall because A.) It would make a striking visual and B.) Brad Pitt could make a daring escape. I answered my own question, and I didn’t like it. Q: Why didn’t the Israelis have people on the wall to prevent something like from happening? A: Because the story wouldn’t have worked if they did. Of course, every fiction writer lives in the world of convenient contrivances, and I’m no exception. Fiction needs contrivances or else the story might be believable but bland. 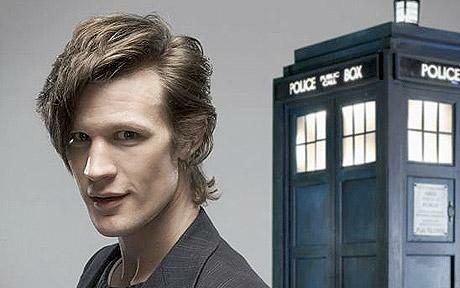 Say the Doctor lands the TARDIS and finds immediately that he’s in a dangerous situation. If he just said, “Forget it, I’m outta here!” slammed the door and got away, the episode would be extremely short and not very interesting. So, oftentimes the Doctor must stay where he is, or can’t get back to the TARDIS, or there’s something to keep him in the thick of things. I’m pretty forgiving of these contrivances because I see how necessary they are. So long as the justification for the Doctor hanging around (when he should just leave) is acceptable, I can suspend my disbelief long enough share in his adventure. I write a blog now. Blogs are cool. It’s when that justification is weak or too jagged a pill to take that the wheels start to come off of a story. So, it’s that justification that holds things in place around the periphery. Think of a story, or even a specific scene in a book, movie, etc. 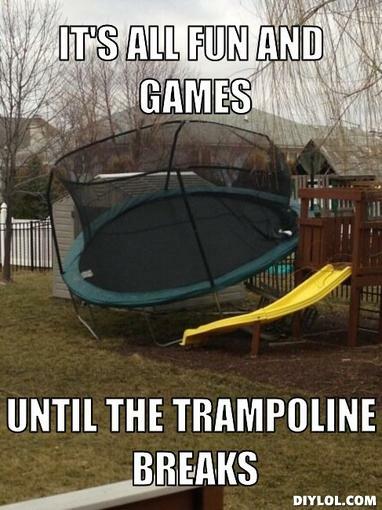 as a trampoline. The black bouncy part is the scene/story itself while the justifications are like the springs that keep it all in place. In the case of World War Z, it feels like not enough thought was given to the periphery of that particular scene, and so my suspension of disbelief came crashing down just like I had hopped on a trampoline with only a fifth of its springs. Let me give you another example, also from a movie. In Star Trek: Into Darkness, there is a scene that really irked me. Kirk and Khan must get from the Enterprise over to the enemy dreadnought, Vengeance. Conveniently the transporter system is down, but the Enterprise is damaged, so I give them a bit of a pass there. So, Kirk and Khan decide to physically launch themselves across to the other ship using spacesuits. There’s a debris field between the two ships that they have to navigate through to make things interesting. Okay, I’ll bite. The hatch that they have to hit at incredibly high speeds on the Vengeance is extremely small. Um, sure, a small thermal exhaust port right below the main port. Got it. Scotty, meanwhile, has infiltrated the enemy ship, and it’s his job to open the hatch when the two space jumpers get close. The controls to open the hatch are in a long, narrow bay with a high ceiling. Here’s the odd thing, though – the hatch is just a hatch, not an airlock. Opening the hatch will decompress that entire large compartment. 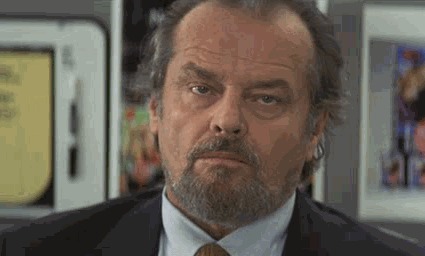 How my face looked at the time. Maybe I just needed a Snickers. On a starship wouldn’t you want all of your exits to be airlocks? What purpose does that bay even serve if the whole thing can be decompressed at the touch of a button? Could it be a cargo loading bay, where things either can or must be loaded/unloaded under vacuum? No, the hatch is barely big enough for two men to fit through at the same time. So, why is the hatch even there then? Once again, I answered my own questions. Q: Why isn’t that hatch an airlock? A: Because Kirk and Khan would smash into the inside door if it was. Q: Why is that hatch so small? A: To artificially inflate the drama of the scene. Q: Why is the room so long and narrow? A: So Kirk and Khan have enough room to skid to a halt. The whole scene unraveled for me right there in the theatre. My best guess is that the writers came up with the idea for a cool action scene and didn’t spare much on all those elements surrounding it. Once again, a trampoline without springs. Unfortunately, this is a trend I see in movies more and more these days. Yeah, in more ways than one. So, where I am going with all this? This is a plea to fiction writers to think around the peripheries of their stories, the parts that are sitting just outside of the spotlight. I know fiction writers out there already have their hands full creating compelling characters, coming up with exciting storylines and so forth. Even still, please don’t forget to at least give the edges of your stories a once over, maybe even spend some quality time making sure the springs are secure before attempting a backflip. Can you over-justify a scene? Can you make the springs so big that the black bouncy part is the size of a trashcan lid? Of course you can, but I would much rather be accused of putting far too much thought into something than not enough. This entry was posted on Wednesday, July 3rd, 2013 at 10:08 pm	and tagged with Making Sense, Spoilers, Star Trek, World War Z, Writing process and posted in General Stuff, Uncategorized. You can follow any responses to this entry through the RSS 2.0 feed.